Ela from Event Espresso was able to travel around Barcelona for a week and put together this lovely travel guide for us to use. If you're ever thinking about visiting Spain she has put together a day to day guide along with a list of Travel Tips to remember when traveling overseas. Arrived at Hotel Porta Fira in Barcelona! 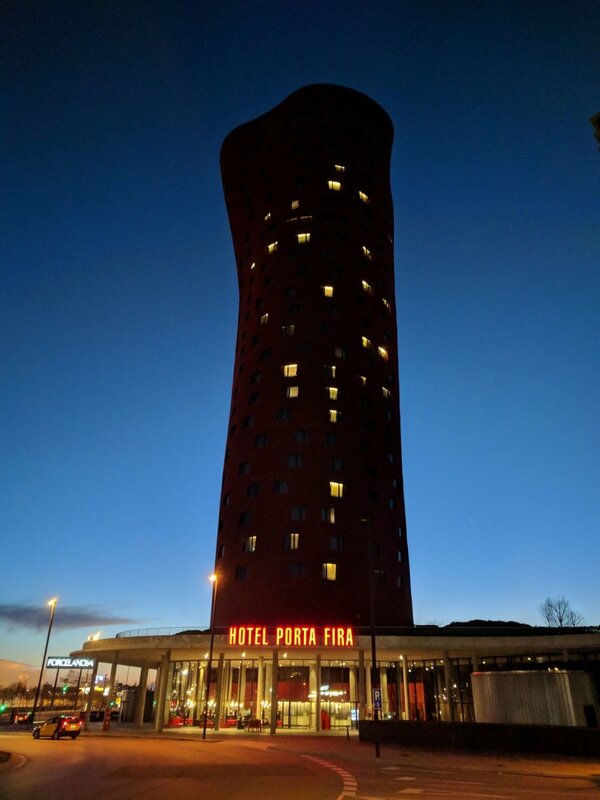 This hotel is a little on the outskirts of downtown Barcelona, you will need to take the metro to get into the main part of town. But it is super clean, contemporary, and comfortable. It also happens to be right next door to a wonderful, trendy cafe called Faborit Fira. This is a great spot to grab coffee, check email, and grab lunch/breakfast. They also have delicious freshly squeezed juices for reasonable prices! There are several famous cathedrals in Barcelona. I chose to visit Barcelona Cathedral over Basilica of the Sagrada Familia, considering it has been under construction for years so I find that distracts from the view. Near Barcelona Cathedral is the Gothic Quarter which is a really unique area to check out. There are dozens of alleyways, twists and turns throughout ornate European buildings that really make you feel like you’ve traveled back in time. While wandering through the Gothic Quarter, we found a cute lunch cafe called Black Remedy that had yummy coffee, salads, burgers, and desserts! Afterwards we walked to Parc de la Ciutadella to find a bench and relax, but got distracted by the Arc de Triomf nearby. We headed over that way instead as it was full of tourists and locals all hanging out in the nice weather. We visited one of Barcelona’s most famous locations-Park Güell. This location was made famous by artist Antoni Gaudí where you can see some his gingerbread house type architecture from this park. To get to the most “famous” view, you had to purchase a ticket, so instead we just walked around the trails of the park where we could look down onto panoramic views of the city and some other pretty views of old buildings and pathways. We visited Museu Nacional d'Art de Catalunya where the art ranges from Medieval Romanesque to Gothic, Renaissance, and Baroque all the way up to Modern art. Tickets were 12 Euro per adult and definitely worth it; we spent hours there and took tons of photos! Plus the outside architecture and view is pretty cool. We were pretty hungry after our art trek and took the train to a hole in the wall churros spot, Xuerria Trebol, where we tried churros with melted chocolate and a Nutella & vanilla creme filled churro! It was cloudy and chilly we so decided to visit the L'Aquarium Barcelona. Tickets were 20 euros each, but I’d say it's worth it if you don’t have other plans for the day. There were lots of exciting exhibits and an awesome walkthrough tank where you stand on a conveyor belt and take in the underwater scenery of sharks, sting rays, eels, and all kinds of fish. Speaking of fish, that night we had seafood at Paradeta Sants. This casual restaurant was so unique-you order whatever you want at the front and they cook it up for you in the back. We shared octopus, clams, shrimp, and calamari with a bottle of white wine. It couldn’t get much more fresh and was surprisingly reasonably priced. My favorite brand of backpack/purses is a Spanish company called Abbacino that doesn't ship to The US, so I was on the hunt to find a new backpack before I left. This brand can be found at Spain’s most famous department store, El Corte Inglés, which is multiple floors and carries the top luxury brands. I also picked up a few souvenirs while here and relaxed with a fancy caramel cappuccino at Faggi Café. Afterwards, we had one more main attraction to hit-Mercado de La Boqueria. This market is packed with tourists and locals alike where you can order fresh meat, seafood, and candy along with a vast amount of appetizers, cheese, olives and even stop for a full meal at some of the stands. You will walk A LOT. Even after purchasing the 5 day unlimited metro card (€35), the metro stops underground can be very far apart. I walked a total of 4-8miles per day! My back and feet were starting to kill me, but it's nice not having to blow money on a cab. Tap water is not free. Many restaurants/cafes only offer bottled water. Even if you receive tap, expect a few extra euros on your check. Tipping is not expected. There is no line on the credit card receipt to tip. If you want to tip, you can leave a couple euros in cash on the table or at the counter. Always choose Euros! When paying with an American credit card at a shop, restaurant, or cafe, there will be an option to pay in Euros or dollars. Always pick Euros because your bank will charge you a lower exchange rate. The metro stops running at midnight on weekdays. We found this out the hard way when we overheard another couple in a rush to leave the bar. Only then did it occur to us that the train may stop running at certain times. We had to pay the bill and sprint to the train, catching the last one at 11:55pm. It also only starts running again around 5am, so we had to take a cab to the airport around 4:15am for our flight home. Although you’re in Spain, nothing is in Spanish! This came as a big disappointment to me because I speak intermediate Spanish and was looking forward to practicing. But Barcelona (Catalonia) is an entirely different culture; they hope to one day succeed from Spain so they do not identify with the Spanish language...everyone speaks Catalon. It was not always easy to split the bill. My partner’s trip was paid for by his work, and I was paying my way. We ended up not being able to split the bill several times because they either needed to know beforehand, needed half paid in cash, or had to separate all items singularly. I would recommend asking before you order if they accept your credit card, can split your check, or anything else that may cause an issue.